Poison ivy. An amazingly versatile plant. It does indeed grow just about everywhere. Waiting for the train to New York City in the sleepy little town of New Hamburg, NY, I wandered off down a quiet street by the station. 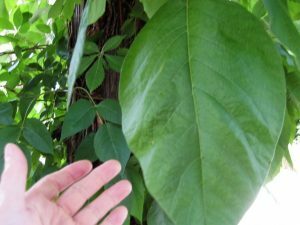 Idly glancing at a roadside tree, I couldn’t figure out what kind of tree had such large leaves, growing so close to the ground. I went closer, reached out…and realized (in the nick of time) that the pattern of three leaflets was familiar. I think this is the single biggest poison ivy leaflet I’ve ever seen. Then, it’s off to catch the train and head down to the big city. New York–the ultimate urban experience. 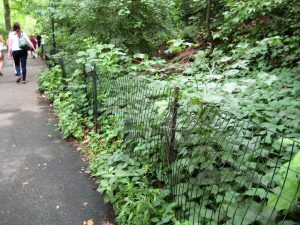 Right in the exact center of the city is Central Park, and right in the exact center of Central Park is a lovely, lush expanse of poison ivy. Lots of it on both sides of the fence, lining the sidewalk just at ankle-height. Not that a bit of poison ivy in the park is a bad thing, mind you. 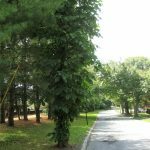 Central Park is famed in birding circles for being a wonderful spot for birding, especially during migration–a crucial oasis of green in a desert of blacktop. 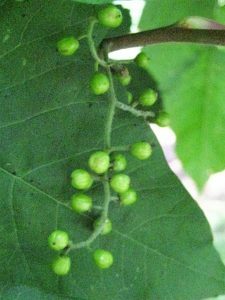 And poison ivy berries are great for birds, whether they’re urbanites, suburban commuters, or just feathered tourists passing through. Poison ivy is also good food for insects, who love to munch its luxurious leaves (and apparently neither birds nor bugs get itchy.) So poison ivy provides not only berries in winter but bugs in summer for the bird life to munch on.